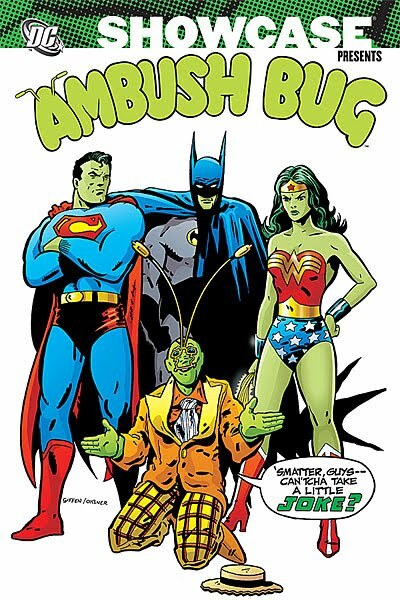 Showcase Presents Ambush Bug, out March 25th, includes a reprint (in black & white) of Action Comics #563; that's the issue with the small illustration of Bethany Snow by Perez. Original Cover Price $16.99 - Your Price is $13.99! Volume 1 - 1st printing. Written by Keith Giffen, Robert Loren Fleming, Paul Kupperberg and Paul Levitz. Art by Keith Giffen, Robert Oksner, and Carmine Infantino. Cover by Keith Giffen and Bob Oksner. Collects DC Comics Presents (1978-1986 DC) #52, 59 and 81, Supergirl (1982-1984 2nd Series) #16, stories from Secret Origins (1986-1990 2nd Series ) #48, Action Comics #560, 563 and 565, Ambush Bug (1985) #1-4, Son of Ambush Bug (1986) #1-6, Ambush Bug Stocking Stuffer (1986) #1 and Ambush Bug Nothing Special (1992) #1 - whew! Softcover, 480 pages, B&W.